As per information and advised from the Central Office headed by USEC Alain Pascua – Undersecretary for Administration, all permanent DepEd employees must create an account to Workplace by Facebook. This will be used to disseminate information to collaborate, share ideas and work together as one organization. 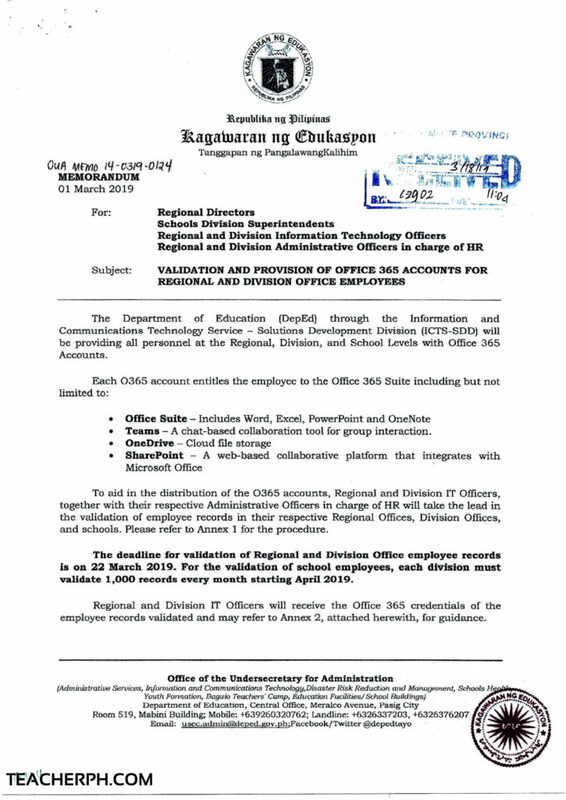 Pursuant to DepEd Memorandum (OUA Memo 14-0319-0124) entitled “Validation and Provision of Office 365 Accounts for Regional and Division Office Employees” and based on the previous DepED SIPAG 2019 Workplace Set-up, all employees both teaching and non-teaching (with permanent item) is required to download Facebook Workplace and register using the DepEd Email Account. Personnel with inactive or NO DepEd Email accounts may personally visit the Division Office, Information Communication Technology Unit (ICTU) for Technical Assistance. 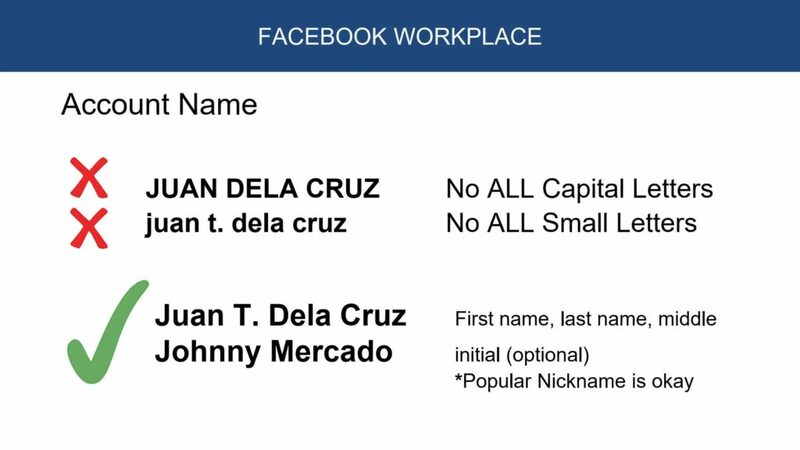 DepEd Central Office thru the Office of Undersecretary for Administration has created and designed a specific format in registering Facebook Workplace. Facebook Workplace Account must follow a particular format. Your name must be encoded following the format: Juan T. Dela Cruz (please take note, not in Uppercase and it must be your real name). Designated ICT Coordinators are advised to assist their school heads and co-teachers in creating the said account. The Department of Education (DepEd) through the Information and Communications Technology Service – Solutions Development Division (ICTS-SDD) will be providing all personnel at the Regional, Division, and School Levels with Office 365 Accounts. Teams – A chat-based collaboration tool for group interaction. To aid in the distribution of the 0365 accounts, Regional and Division IT Officers, together with their respective Administrative Officers in charge of HR will take the lead in the validation of employee records in their respective Regional Offices, Division Offices, and schools. Please refer to Annex 1 for the procedure. The deadline for validation of Regional and Division Office employee records is on 22 March 2019. For the validation of school employees, each division must validate 1,000 records every month starting April 2019. Regional and Division IT Officers will receive the Office 365 credentials of the employee records validated and may refer to Annex 2, attached herewith, for guidance. Each region and division may identify and implement their own validation and division processes, as they see fit, following rules and regulations on data privacy. All employees, at all levels of the organization, must ensure the safekeeping their respective 0365 credentials. In addition, employees are prohibited from sharing their accounts to other individuals or organizations, and utilizing the 0365 accounts of other employees. For immediate and appropriate action. 1) Generate list of employees from eHRIS (fo .ehris.deped. gov.ph). 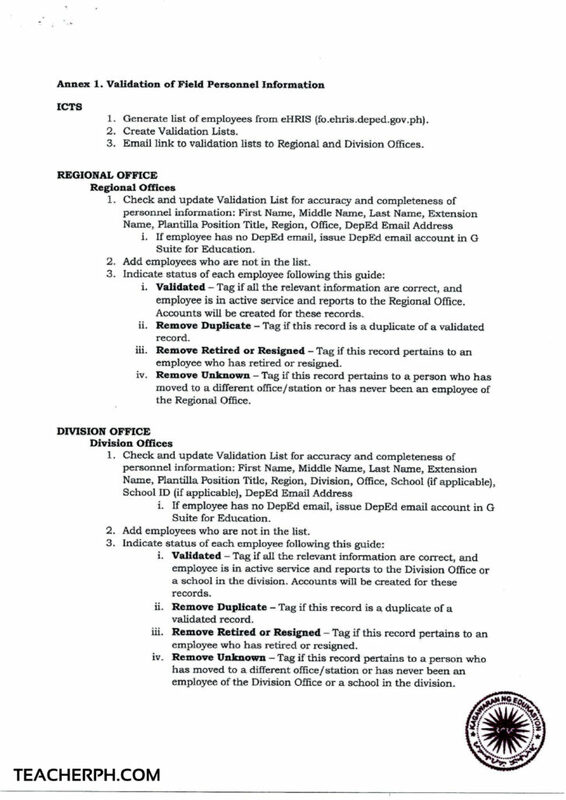 3) Email link to validation lists to Regional and Division Offices. i. If employee has no DepEd email, issue DepEd email account in G Suite for Education. 2) Add employees who are not in the list. i. Validated – Tag if all the relevant information are correct, and employee is in active service and reports to the Regional Office. Accounts will be created for these records. ii. Remove Duplicate – Tag if this record is a duplicate of a validated record. iii. Remove Retired or Resigned – Tag if this record pertains to an employee who has retired or resigned. iv. Remove Unknown – Tag if this record pertains to a person who has moved to a different office/station or has never been an employee of the Regional Office. i. Validated – Tag if all the relevant information are correct, and employee is in active service and reports to the Division Office or a school in the division. Accounts will be created for these records. iv. Remove Unknown – Tag if this record pertains to a person who has moved to a different office/station or has never been an employee of the Division Office or a school in the division. Download validated accounts in Validation List every two weeks. Create accounts and provide credentials to ITO for distribution thru the Validation List eveiy two weeks. ITOs shall access the 0365 credentials issued to employees in their respective validation lists. ITOs shall implement distribution process of Office 365 credentials to employees.